As a student in the Herberger Business School's entrepreneurship program you'll learn how to become an effective and successful entrepreneur in a diverse, global economy that needs small business leaders willing to develop new ideas and new industries. You'll graduate with the conceptual tools and the management, finance, law, marketing, technology and customer service skills needed to launch new ventures that will generate economic growth and prosperity. Our program is an incubator for entrepreneurial adventurers who want to start their own business, open a franchise, or work in an emerging or high-growth industry. 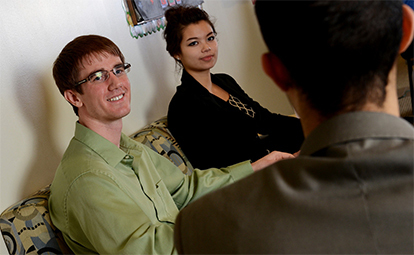 Herberger Business School students' studies take place amid modern technology with easy access to advising, career and counseling services. Herberger faculty nurture students' creative potential and build their critical-thinking skills. Entrepreneurship Club offers students a chance to develop leadership skills by organizing and running businesses. The club links students to professionals through visits to established businesses and unique startups. Students graduate with a solid understanding of business opportunities and the development of business plans. They leave prepared to make meaningful contributions to society. Faculty in Herberger Business School have been published in some of the most prestigious and influential professional journals and presented at conferences nationally and worldwide. Notable alumnus: Rob Weber '08 is senior vice president and co-founder of NativeX, a Sartell company named one of the state's 10 fastest-growing businesses by Minneapolis/St. Paul Business Journal in 2013.